Mix and match different throw pillows for your home with the confidence of a professional using these five easy to follow tips. Throw pillows can complete the look of your home, just like the right pair of shoes can make or break an outfit. They are one of the last accessories to be added, but can set the tone for the entire style of a room. 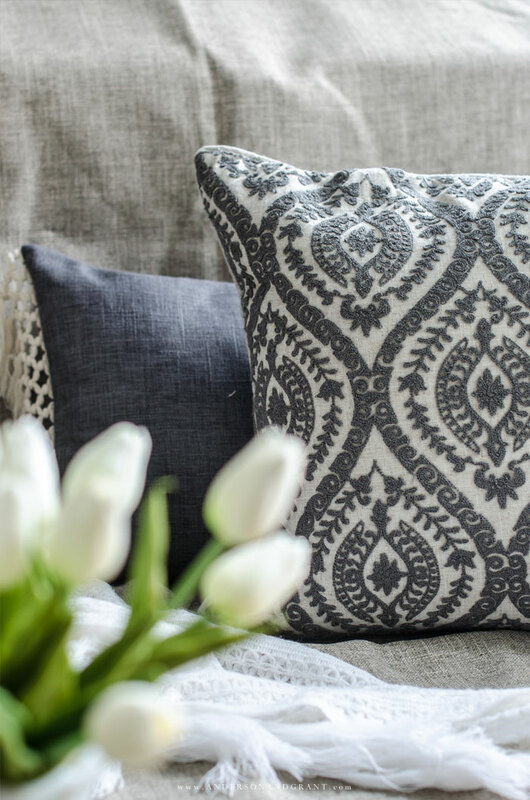 Because there are many options to choose from at a wide range of prices, adding pillows to your sofa or bed is the easiest and most cost effective way to completely change the feel of the space. They provide a pop of color, texture, and pattern and can be restyled often to easily refresh your decor. But as wonderful as that all sounds, mixing and matching throw pillows can seem like an impossible decorating task to get right. As you scroll through your favorite blogs or flip through a magazine, you may see sofas adorned with over seven different pillows at a time and wonder just how they choose so many that all seem to go together. Going into a store and choosing one pattern and one solid for pillows is easy. But finding that right assembled collection that gives the look of a professional decorator's touch can be overwhelming. Even though there is a bit of an art to doing this, choosing complimentary pillows isn't as hard as it seems as long as you keep a few tips in mind. CHOOSE ONE LARGE PRINT, ONE SMALLER PRINT, AND A SOLID TO ANCHOR THE MIXTURE. 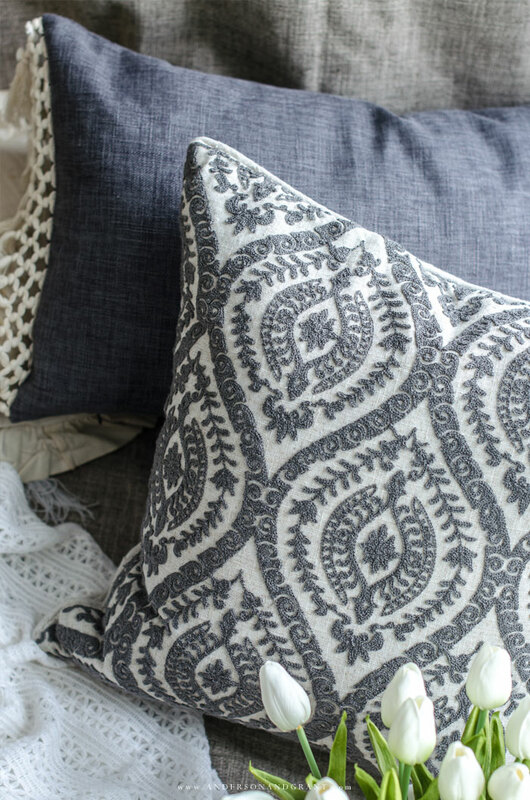 If you are just starting out, the easiest way to begin mixing and matching throw pillows is to choose two pillows with prints that coordinate together in terms of scale and colors and then add in one solid colored pillow in a shade that matches the prints. As you get more confident with this basic skill, you'll find that it is easier to add to the combination of three. But starting with a trio allows you to see exactly how different prints and shades of colors can play off one another and how that solid colored pillow can bring everything together for one complete look. Make choosing coordinating pillows less overwhelming by sticking to a single color palette and work with shades. Now this doesn't mean that you have to choose three completely blue pillows. Maybe there is a floral pillow that you fall in love with that also has shades of tan and green to the pattern. That is completely fine. But then you need to choose the rest of your pillows keeping that color palette in mind. Find coordinating blue shades that will also compliment the other colors in the original pattern. Fill in with some neutrals. You just need to keep all the colors complimentary. One pillow in your trio should have some type of texture to it. Maybe it is a woven pillow in a solid color. Maybe it is a plain pillow with embroidery on the front. Or it could be created out of a houndstooth wool. A textured pillow has anything that makes you want to reach out and touch it. Texture is important because it is what moves you away from just having three pillows that coordinate in color to having a collection with interest and dimension. You don't need to buy all square 16x16 inch pillows. Buy some that are larger and others that are smaller. Add in a rectangular or even circular pillow with the square ones. Start with a standard 22 or 24 inch pillow in back and get smaller and more varied as you progress forward. NOT EVERYONE SHOULD BE SCREAMING "LOOK AT ME!" You don't want any one pillow to compete with another that you've chosen. If things are in dramatically different colors or everything has a different texture or embellishment, your collection of pillows is going to look chaotic. It is going to seem like you just went out buying random pillows that caught your eye with no consideration of who it was going to sit beside. Have one standout or statement pillow and then find ones that will compliment it. What you are looking for is to find that sweet spot where you love the way different patterns and colors blend together into one cohesive set. It can actually become an addicting past time once you get the hang of it. The result should look like you have a collection of pillows amassed over time, but that you knew exactly what you were looking for when shopping for them. Ultimately, this is a design skill that is unique to each individual person. What one homeowner views as the "perfect combination" may not look that way to another. These tips are guidelines to help build confidence in your own abilities. 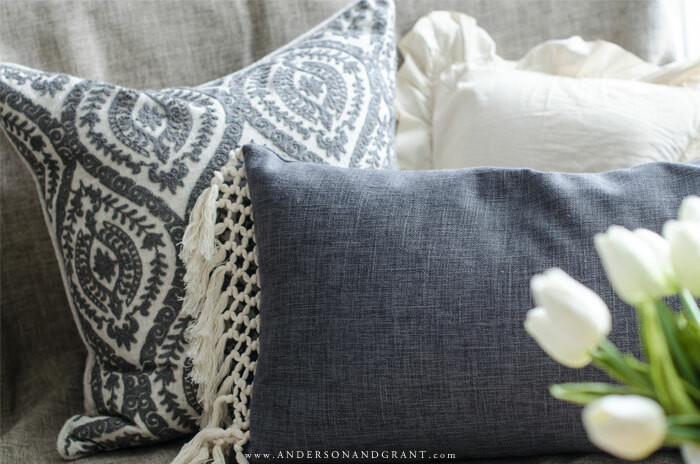 I encourage you to play around with choosing different pillows in the store or online to experiment and get a feel for what looks good together, even if you don't intend on purchasing anything right now. The more you mix and match, the better you will get at finding what appeals to you. Something else to keep in mind.......Some of the prettiest pillows can be pricey and you may believe it isn't possible to be able to have a collection and still afford something nice. But remember that even the dollar store has pillows. There is nothing wrong with spending a little more on a statement pillow and placing it in front of a solid colored one you bought for $5 at Dollar General. 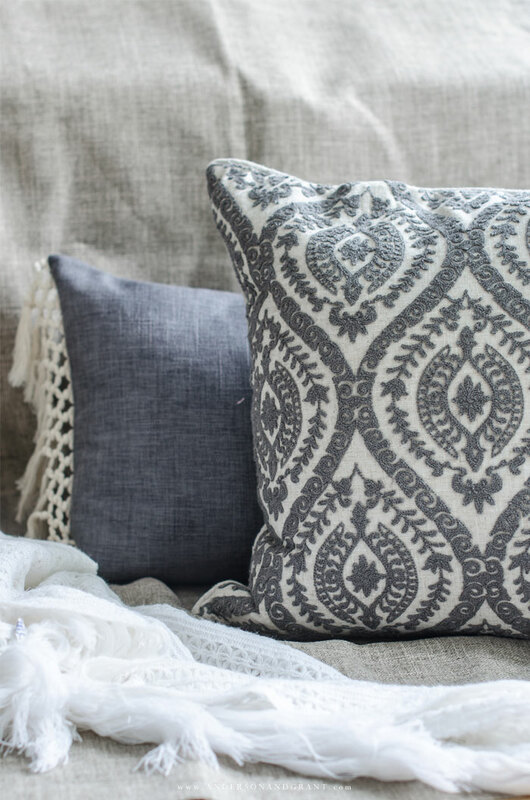 And a final tip for you today......If you are shopping online, Pier1 Imports has a section on their website where the pillows are divided into collections of coordinating pillows for you to shop from which makes this whole process virtually painless. It doesn't matter what the style of your home is, what your favorite colors are, or the budget you are constrained by. And you don't have to be a designer to have a well styled home. 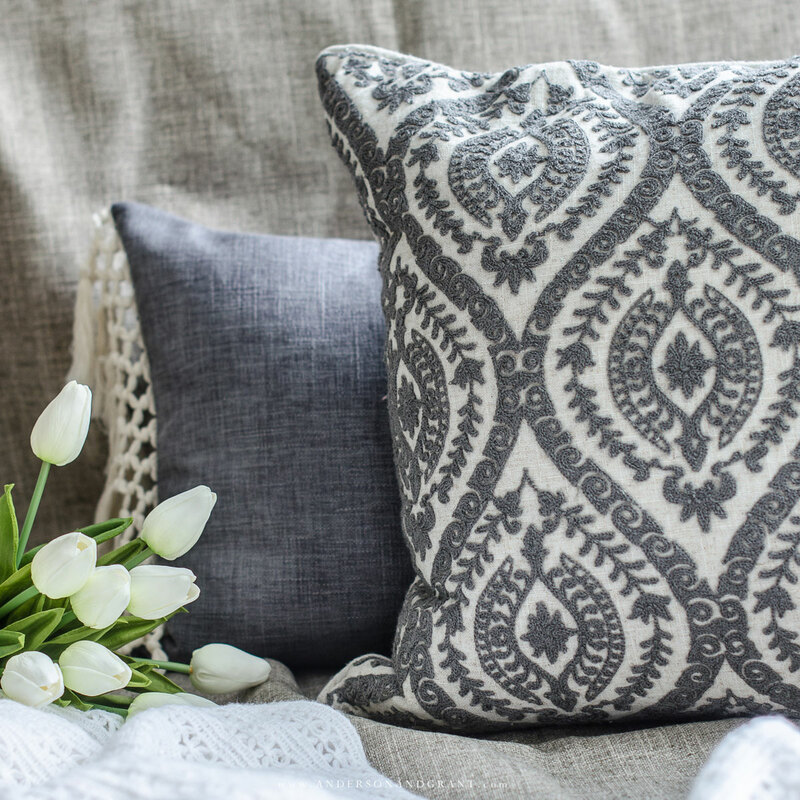 Mixing and matching throw pillows is something anyone can do to increase the decorative appeal of their room as long as you can remember a couple tips to help you do it.